If you've had a gas powered airsoft gun for any length of time, odds are, you have needed to remove either your main or fill valve at some point. If you didn't have the right tool in your toolbox, you probably had to rig up some sort of screwdriver setup to get it done which may have damaged your valves. Having the right tool makes the job much easier, and today, we're taking a very quick look at a multi-function tool by Evike that will help you remove and install the valves on your gas replicas. I was sent this tool by Evike who has it available HERE, currently priced at $15. It was sent out by USPS which got it to me in a few days. Evike tends to ship small items like this via USPS which is a fast and cheap option. The TriValve tool is a full metal tool that is used to remove and reinstall both the main gas valve as well as the fill valve on your gas magazine. It is designed to work with three different types of valves making it compatible with pretty much every gas gun out there. It's made of stainless steel and anodized aluminum, so it should pretty much last forever. 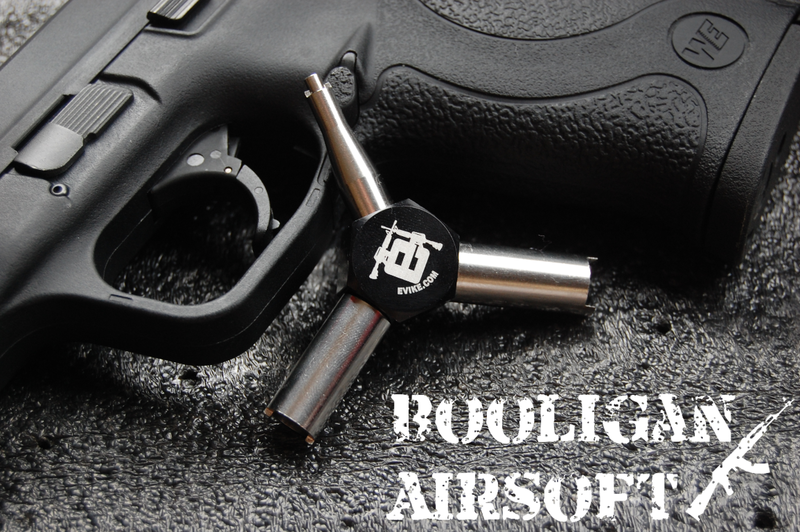 There are three different keys on the tool designed for the different valves that you may run into on a wide variety of gas airsoft guns. The smallest key is designed to remove the fill valve on damn near every gas gun. It has a small tube on the key that fits over the inner tube to keep everything centered when you unscrew it. The medium sized key is for the main valve which is normally located towards the top of the magazine on most pistols. I tested it for compatibility with my large collection of pistols and it worked with my WE, KJW, KWA, KSC, HK3P, VFC, SOCOM Gear, Echo 1 and HFC pistols. It'll work with almost every pistol you come across, and if it doesn't work with that key, try the largest key. Now, there are a few reasons that you might want to remove your valves. The first reason is for routine maintenance. Sometimes, the valve seals can dry out and leak, and a good way to rejuvenate them is to remove them and soak them in pure silicone lube overnight. This will help expand the O-rings and seals and seal everything up. You can also take this opportunity to polish and open up your valves using a dremel tool. This can give you more power and higher velocity because of the higher gas flow. It's a pretty simple mod and if you have a dremel tool, it's a no brainer. All in all, this thing is a pretty damn handy tool that will help you properly take care of your gas pistol. If you want to easily access your gas gun's valves in order to lubricate, repair, or modify them, this is pretty much the easiest way to do it. Yes, you can use a screwdriver on some valves, but you do risk damaging them if your hacked together tool slips, which could require you to buy a whole new valve. If you make a habit of working on your gas guns, buy the right tool for the job. It's as simple as that.